Introducing the next evolution of the Happy Mat - the Happy Bowl! 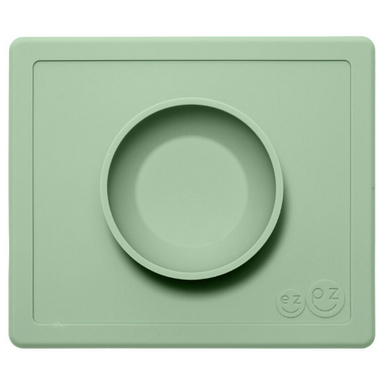 The ezpz Happy Bowl is an all-in-one placemat + bowl made from high quality silicone. It suctions directly to the table, making it difficult for tiny hands to tip over. At a height of 1.5 inches, the bowl is perfect for a variety of foods, including pasta, soup, oatmeal and cereal. Works okay, still not the best as it comes off our table fairly easily. Such a beautiful colour and perfect size for home and on-the-go use. Great addition to our ezpz collection for soups, cereal and yogurt. Great mat. Made a big difference for my 6mo old when it came to meal time. It's so much easier for him to grab his food and he's no longer chasing it around the table top. Only down side is that it doesn't stick that well to our reclaimed wood table. But that's more a table issue, less the mat.